As promised in my earlier post for DIY: Barn Wood Shutters for Pallets, I would like to show you how I made my barn wood valance. It’s really very simple, just a few items needed, but this is a lengthy post to give you all the information you need, so bear with me! 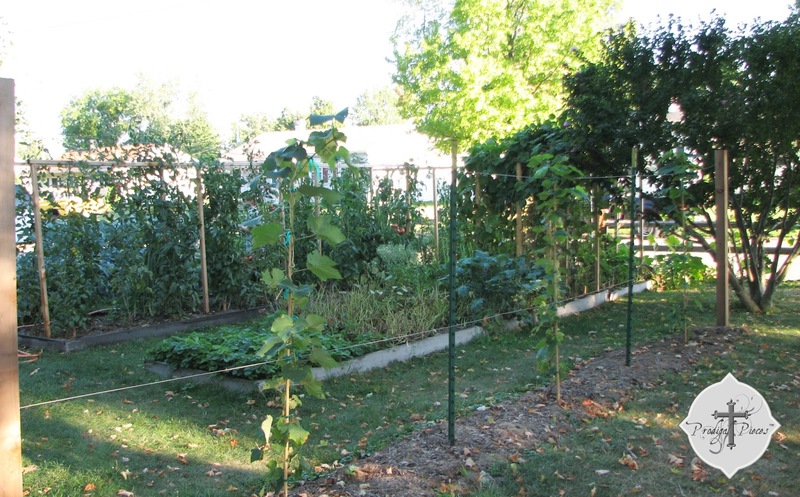 Back winter of 2011, we decided that since we were not able to sell our home and have our country living we so long for, that we would be putting our garden out in our front yard. We live on a quarter-acre lot and have plenty of room, but our back yard is completely shaded. We knew we would be going against grain to put one out front, but I am never one to bat an eyelash at being different. 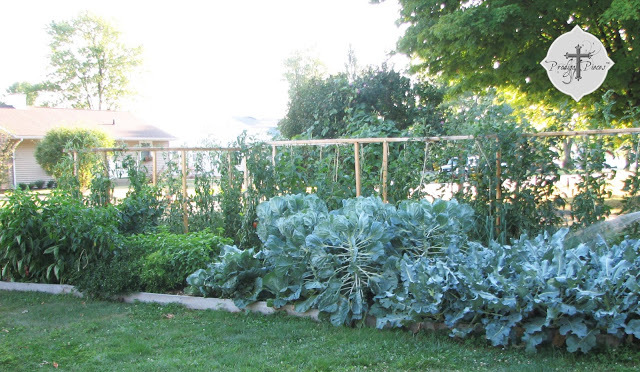 I had in my mind raised beds and knew it had to be made out of a wood that would not leach chemicals into my plants. We couldn’t swing the cost of redwood, and knew barn wood abounds in our area. So I decided to post a wanted on Freecycle for barn wood. God is so good! We didn’t just get some barn wood, but our pick of a couple of buildings on an old farmstead. Yes! The only catch was we had to remove it ourselves… in mid February in Ohio. Let’s just say my husband and son deserve an award for being ankle deep in snow flying sideways removing barn siding with only a hammer, crowbar, and a screw driver – there was no electric hookup! Can you believe I had a camera and forgot to take pictures!! Grrrr! See the barn wood garden beds? Back to the valance. After said garden was built, we had plenty of leftover barn wood to spare and I wanted something to dress up our windows – the ones I knew I would be making shutters for. Now I realize not everyone has access to a homestead barn or even wants to attempt to tear one down. 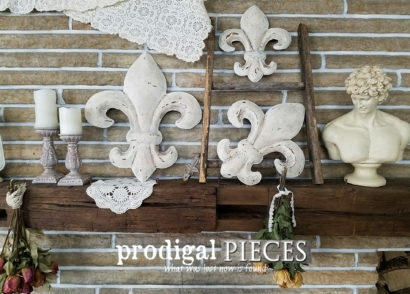 You could use driftwood, fence rails, or even new wood made old. 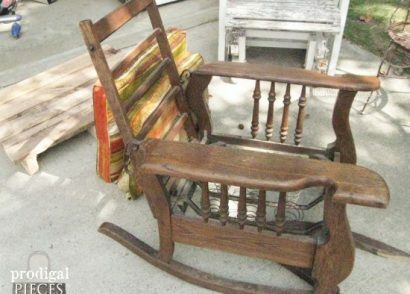 Check craigslist free section for wood too. In a large plastic bowl, combine all of the ingredients with a plastic spoon. Place your nails ( or other goodies you want to rust) in the solution. This will foam and bubble over time, so I suggest placing it outside and on cardboard or newspaper. Leave overnight. Drain off solution. DO NOT RINSE. With gloves on, place your objects on cardboard or newspaper to dry. Now onto the valance. First cut the barn wood to the length you need. You’ll need to take the length of the wood and figure the spacing between the nails you desire. Mine were 6″ apart. To figure the layout of the nails, measure the width and find center – write it down. Your nails will be positioned 1″ in from both ends, so measure your board and subtract 2″ from the total. Take that subtracted total and divide it up by 6 (or desired nail width). It make not come up equal, so then you just get close to 6″ (less or more), and then you will be using that number to space your nails 1″ in from either end. When you get your spacing, mark the board with a piece of chalk. 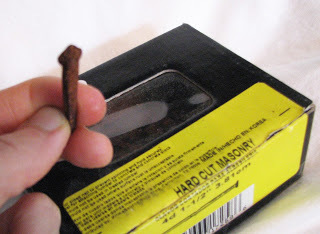 You will need to drill pilot holes with a bit slightly smaller than the middle size of the nail. Go ahead and drill through because you can adjust the depth when you hammer them in. Now for the fabric part. 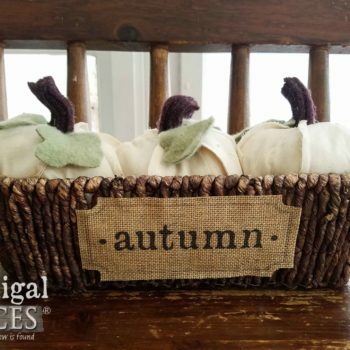 I wanted a simple, rustic, clean window treatment to soften the room, and although I love to crochet, I did not have time to whip up 3 valances. So I decided to find a king-size bedskirt with crocheted edge since they have 3 sides that would fit my windows. I rarely buy anything new, so decided to find a used bedskirt, and I found a gorgeous Cath Kidston bedskirt on ebay for very little money. Some simple sewing skills are necessary to complete the valance. First, cut off the bedskirt sides to the desired hanging length (mine is 9″, with actual length 8″ + 1″ for top hemmed edge). 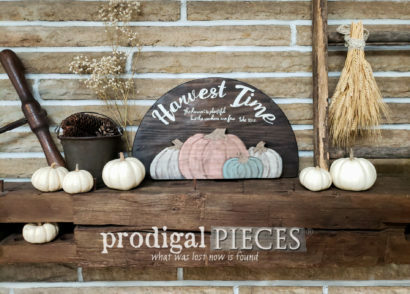 Then, shorten them to the width of you barn wood piece, but also add about an extra 1.5″ per nail width-wise so that it would have a ruffle effect once hung. Fold side edge of valance in a half inch, press. Fold again on itself another half inch, and press to get the finished edge. Now, fold the top edge of valance half inch down and press with iron. Fold again another half inch and press again. Stitch down all folded edges 1/8″ from edge starting at the bottom of one side, go up across top folded edge, and the down the other side, ending at the bottom side edge bottom. When you’ve completed attaching the ties all you need to do is mount the barn wood to the wall with your screws, and then hang the valance. Step back and enjoy how you’ve repurposed barn wood and a bedskirt! Have any questions? Just send me an email and I’ll be happ to help.Become a follower to get more DIY tips in the future! Somehow Junker Dic’s comment is not showing, but he questioned if the rust needed coated to prevent leaching onto the fabric. I responded above. I love that you have a front yard garden! It looks beautiful. The valance and wood are very pretty and homey. Thanks for stopping by. We love having a garden, it’s helped up to really appreciate where we live and that you can do most anything with a little bit of land! I love the look! 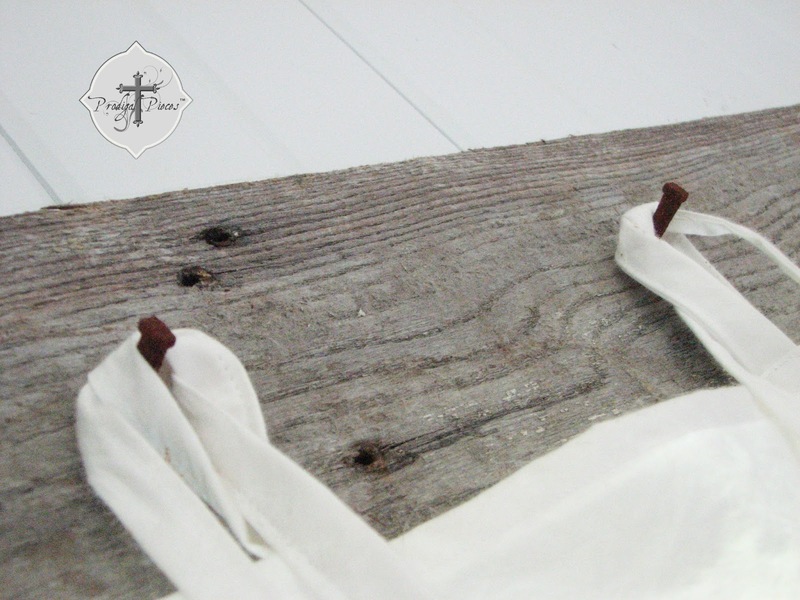 The white cotton valance against the barnwood is gorgeous! Thank you Susan! 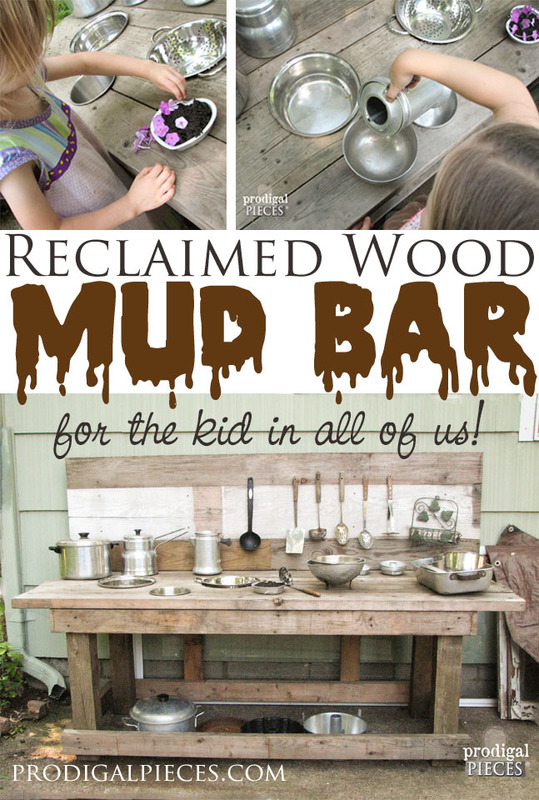 Barnwood is so versatile. Thank you Christine! You got it…opposites add so much dimension. I love the valances you made, rustic yet feminine all at the same time, the perfect combination! I have valances in my kitchen that I made from pallet boards, I may have to add a curtain like you did! Love it Larissa! Thanx so much for joining Treasure Hunt Thursday this week! Do you mind adding me to your party list? :( Hope your week is going well. You’re welcome! Yes, I added you! If it would stop raining here I would be having a better week because I’m painting the exterior of our home and I can’t get much done. sigh. At least we aren’t having wildfires…prayers for those who are. Thank you and love your vintage goodies!! Stopping in to pin. I love your valance. So pretty and so smart, Larissa! I love the mix to soften up the rustic feel. Beautiful job! very fun project, and I like that it is unique. Wow Larissa! What an awesome idea! And so well executed! Just love this! 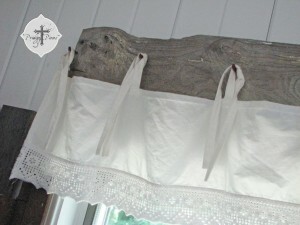 I just love the rustic with the white lacy bed skirt!! Just my style!! Thank you for linking up to Blissful Whites Wednesday!! that’s fantastic. I live on the beach and could easily do this with driftwood. We always have some that washes ashore. I’m so happy you love it, Linda! What a fun story of how you found your wood! Thanks for sharing at the Inspiration Gallery! This is gorgeous! Wonderful tutorial. You’re being featured tomorrow from our Give Me The Goods party. You’ll also be on my FB page Sunday! THIS IS ABSOLUTELY GORGEOUS!!!! I am in love with the inviting contrast between the rustic wood and the pristine fabric. 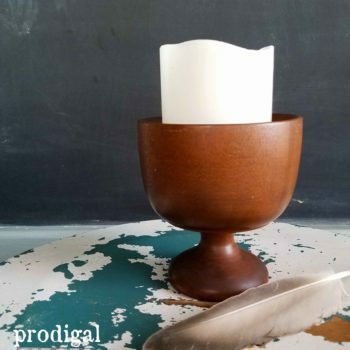 I’m also a homeschooling Christian mom who loves to DIY. I love this how beautiful. So happy to have found your blog. I pinned this. So clever and beautiful.